This is one of the funniest wedding pictures I took at this Roma's Hospitality Centre wedding. While photographing the bride and her bridesmaids, I asked them to throw the bouquets towards me. In this image, we can see several bouquets flying with high-speed towards the camera. To make this image even more believable, I asked the girls to scream while throwing the bouquets. That caused a few laughters and genuine emotions captured in this photograph. In fact, the brides made on the right of the frame through the bouquets so close to me that she looks worried in this image. Fortunately, no photographer was hurt during the creation of this wedding picture. At the beginning of my Toronto wedding photographer career I realize that alternating the posed photographs with more candid and dynamic ones keeps the energy high. That, allows the bridal party to enjoy the experience, which is good for the wedding pictures. Also, that results in more referrals because the bridal party does not expect to have fun during their photo shoot. After discovering this secret, I saw a dramatic increase in my referrals. To create this image, I used a Canon 24 to 70mm lens shot at 24mm and F7.1 to keep both the bouquets and the bridesmaids in focus and achieve a shutter speed of 1/200s so I can use the strobe lights to illuminate the shot. In post processing I removed a few distractions in the background, increase the vibrance of the image and dodged and burnt sections of the picture. 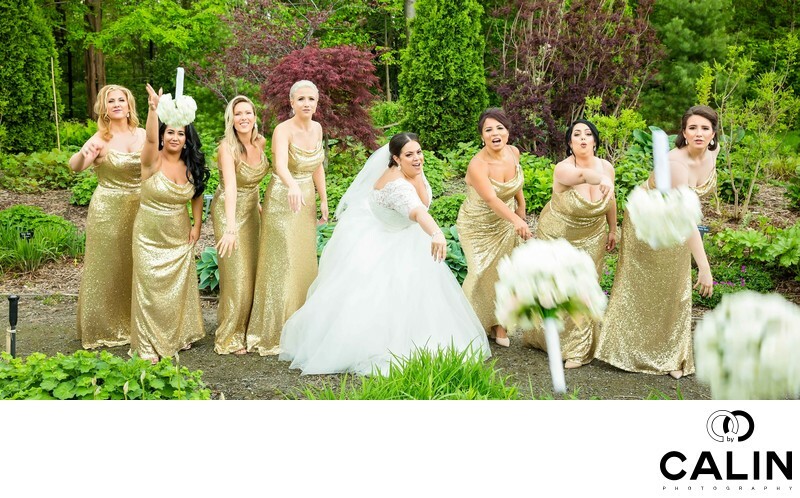 Location: Bridal Party Throw Bouquets at Photographer5980 Shawson Dr, Mississauga, ON L4W 3Z6.